The eruption of Mount Pinatubo in 1991 had a significant impact on climate, decreasing global mean temperature by about 0.5°C. Like the famous eruptions of Krakatau (1883) and Tambora (1815), Pinatubo is located in the tropics, which has been considered an important factor underlying its strong climate forcing. However, an international research group led by the GEOMAR has now published a study in the journal Nature Geoscience that shows that explosive extratropical eruptions can have a strong impact on the climate, too. 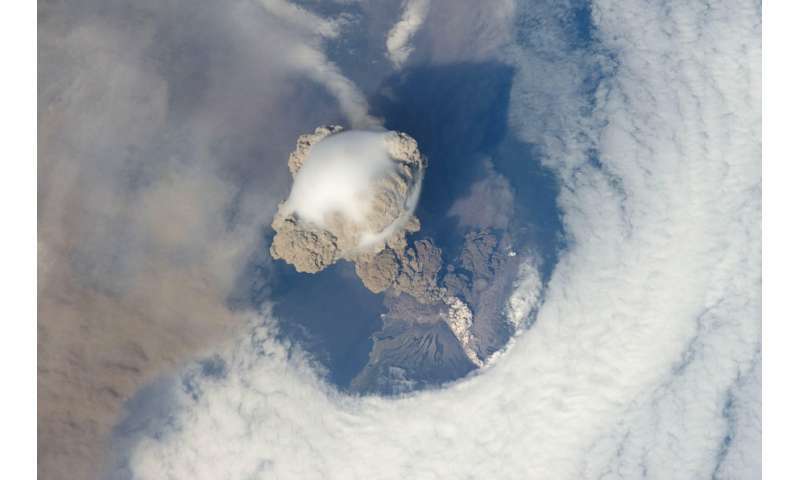 In recent decades, extratropical eruptions including Kasatochi (Alaska, U.S., 2008) and Sarychev Peak (Russia, 2009) have injected sulfur into the lower stratosphere. The climatic forcing of these eruptions has, however, been weak and short-lived. So far, scientists have largely assumed this to be a reflection of a general rule—that extratropical eruptions lead to weaker forcing than their tropical counterparts. Researchers from the GEOMAR Helmholtz Centre for Ocean Research Kiel, the University of Oslo, the Max Planck Institute for Meteorology in Hamburg together with colleagues from Switzerland, the U.K. and the U.S. now contradict this assumption in the international journal Nature Geoscience. "Our investigations show that many extratropical volcanic eruptions in the past 1,250 years have caused pronounced surface cooling over the Northern Hemisphere, and in fact, extratropical eruptions are actually more efficient than tropical eruptions in terms of the amount of hemispheric cooling in relation to the amount of sulfur emitted by the eruptions," says Dr. Matthew Toohey from GEOMAR, first author of the current study. Large-scale cooling after volcanic eruptions occurs when volcanoes inject large quantities of sulfur gases into the stratosphere, a layer of the atmosphere that starts at about 10 to 15 kilometers height. There, the sulfur gases produce a sulfuric aerosol haze that persists for months or years. The aerosols reflect a portion of incoming solar radiation, which can no longer reach the lower layers of the atmosphere and the Earth's surface. Until now, the assumption was that aerosols from volcanic eruptions in the tropics have a longer stratospheric lifetime because they have to migrate to mid or high latitudes before they can be removed. As a result, they would have a greater effect on the climate. Aerosols from eruptions at higher latitudes would be removed from the atmosphere more quickly. The recent extratropical eruptions, which had minimal but measurable effects on the climate, fit this picture. However, these eruptions were much weaker than that of Pinatubo. To quantify the climate impact of extratropical vs. tropical eruptions, Dr. Toohey and his team compared new, long-term reconstructions of volcanic stratospheric sulfur injection from ice cores with three reconstructions of Northern Hemisphere summer temperature from tree rings dating back to 750 CE. Surprisingly, the authors found that extratropical explosive eruptions produced much stronger hemispheric cooling in proportion to their estimated sulfur release than tropical eruptions. To understand these results, Dr. Toohey and his team performed simulations of volcanic eruptions in the mid to high latitudes with sulfur amounts and injection heights equal to that of Pinatubo. They found that the lifetime of the aerosol from these extratropical explosive eruptions was only marginally smaller than for tropical eruptions. Furthermore, the aerosol was mostly contained within the hemisphere of eruption rather than globally, which enhanced the climate impact within the hemisphere of eruption. The study goes on to show the importance of injection height within the stratosphere on the climate impact of extratropical eruptions. "Injections into the lowermost extratropical stratosphere lead to short-lived aerosol, while those with stratospheric heights similar to Pinatubo and the other large tropical eruptions can lead to aerosol lifetimes roughly similar to the tropical eruptions," says co-author Prof. Dr. Kirstin Krüger from the University of Oslo. The results of this study will help researchers to better quantify the degree to which volcanic eruptions have impacted past climate variability. It also suggests that future climate will be affected by explosive extratropical eruptions. "There have been relatively few large explosive eruptions recorded in the extratropics compared to the tropics in recent centuries, but they definitely do happen," says Dr. Toohey. The strongest Northern Hemisphere cooling episode of the past 2500 years was initiated by an extratropical eruption in 536 CE. This new study explains how the 536 CE eruption could have produced such strong cooling.